Well, the Super Bowl has come and gone, and many felt it was quite the disappointment. (Peyton Manning is at the top of this list, I’m sure.) I have to agree, considering I only watched until halftime because my boyfriend got bored. Now, if HE turned off the Super Bowl, you know it had to be bad! For those of us who were not emotionally invested in either team, we were watching the game for the commercials, the halftime show, or, at the very least, for a good game. There were a few pretty good commercials, from what I saw, and I’d be lying if I said more than a couple didn’t pull extra hard on my heart-strings…but then, I’m a sucker for sappy. And from my perspective, Bruno Mars killed it. Spot on, my man. The game though (aka, the MAIN event)? Well, the score says it all. 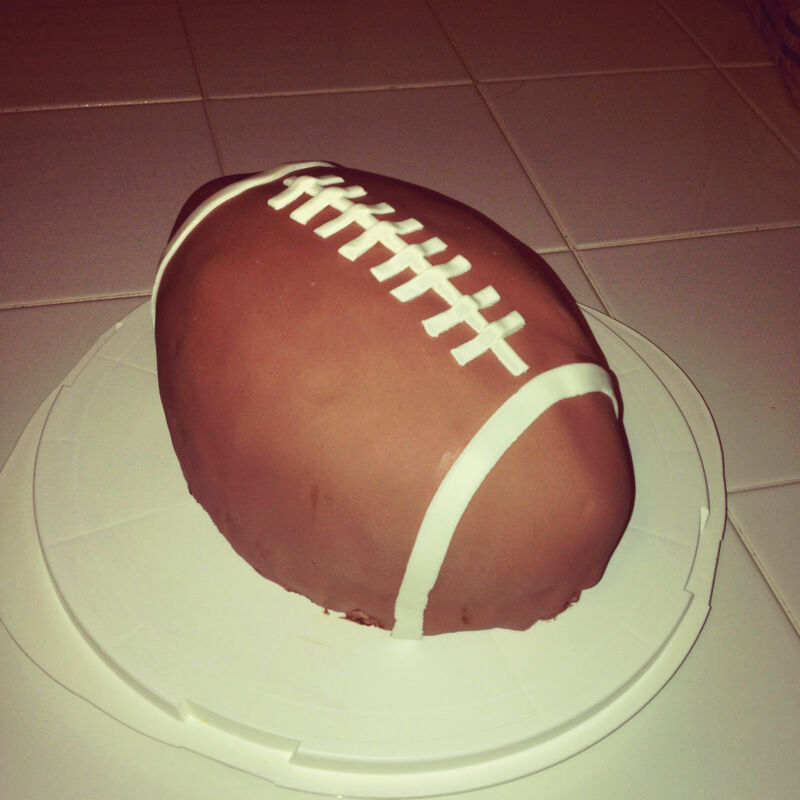 As such, what better way to celebrate the Super Bowl than by making a football cake? 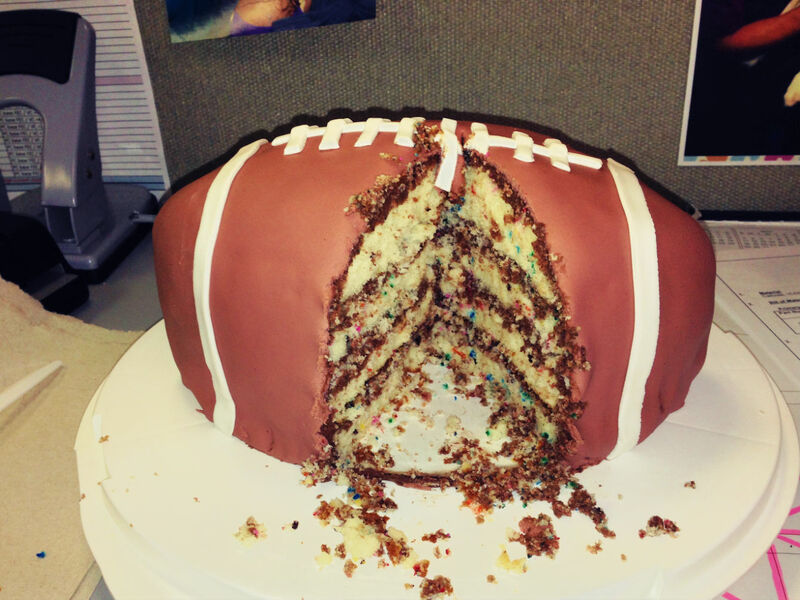 Ok, maybe there are many better ways to celebrate the Super Bowl, but for an avid baker and lover of all things decorating, this way takes the cake! (ha! 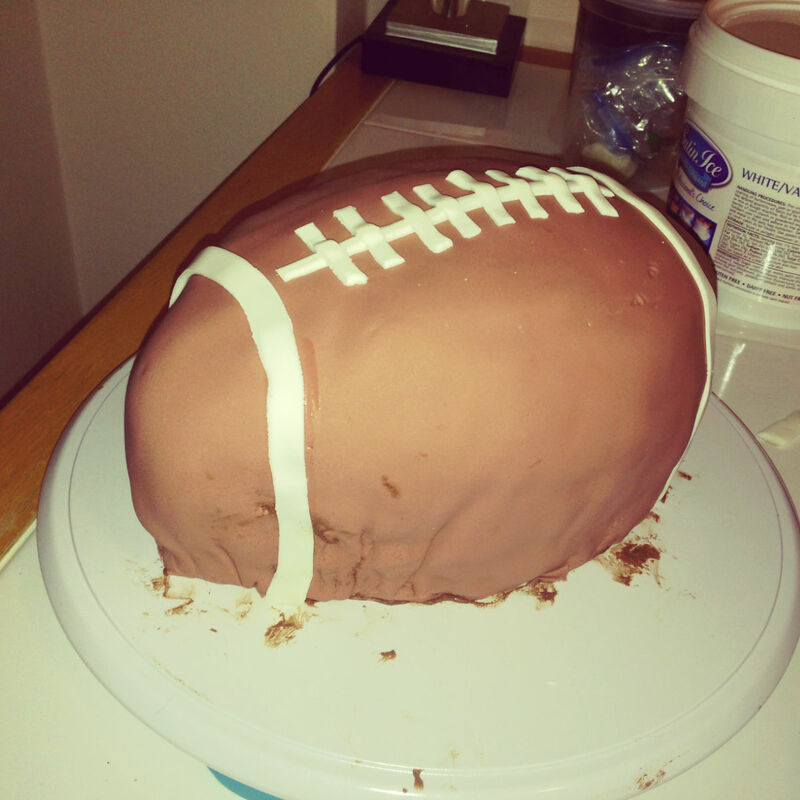 Pun intended…) So, my Super Bowl party involved me making and decorating a cake. 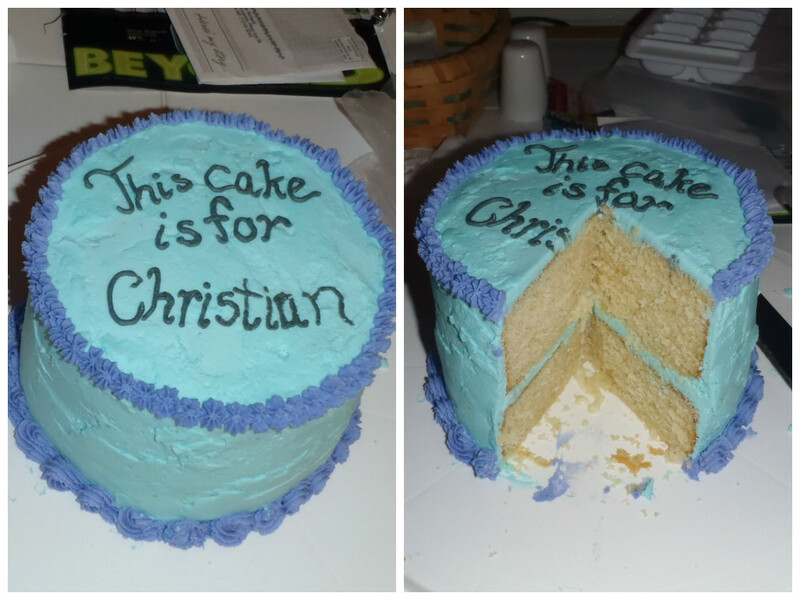 What kind of cake, you ask? 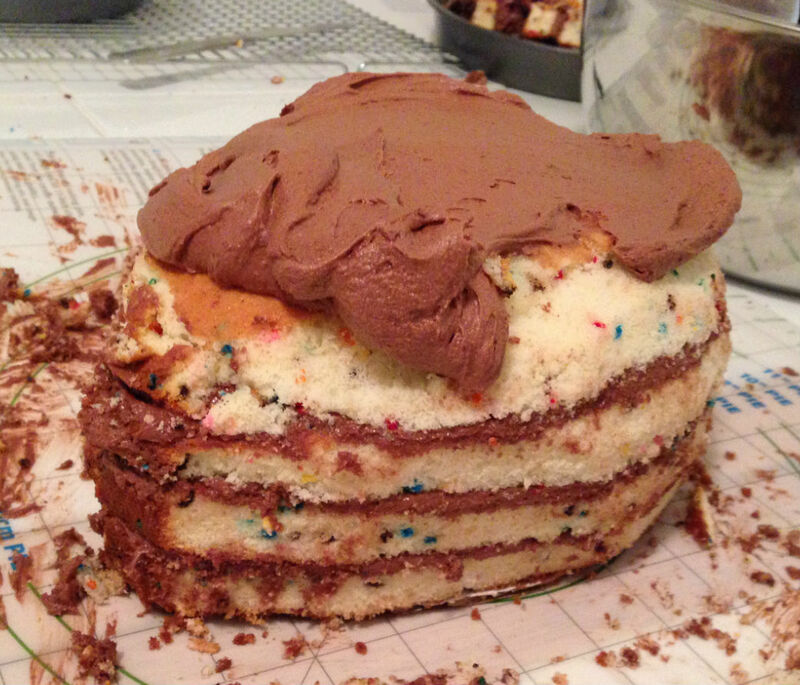 A Funfetti Yellow Butter Cake with Chocolate Buttercream. Covered in fondant. To look like a football! Woo! I really want to practice and improve my fondant skills, so, the only way to do that is by making a cake and decorating it. 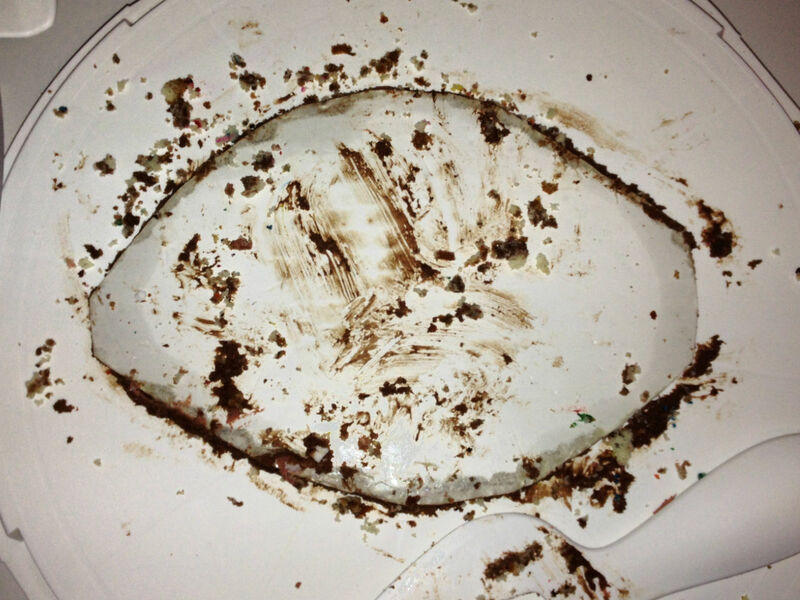 This cake is delicious. It is moist and dense, soft and fluffy, and overall wonderful. It is the perfect amount of sweetness, and paired with the frosting, it is irresistible. 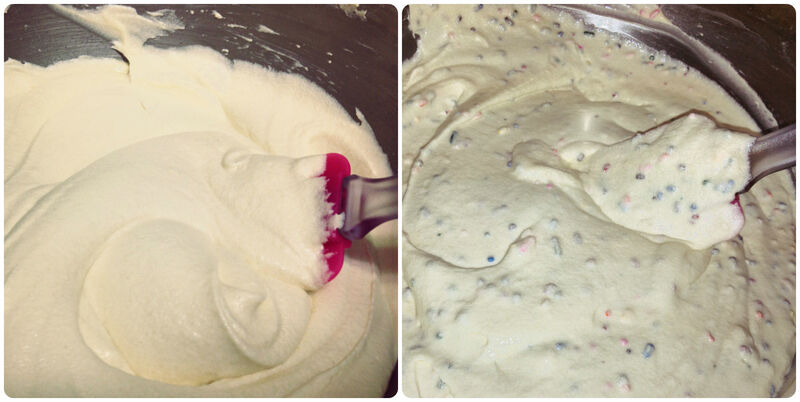 And in case the flavor alone is not enough to put a smile on your face, the little morsels of funfetti delight will. To start, I used a different method of mixing than most of my recipes. I usually cream the butter and sugar together first, then add the rest of the wet ingredients, then add the dry ingredients in three parts to that. This recipe, however, uses a method known as high-ratio mixing. In this method, you mix all the dry ingredients with all the butter and some of the liquid first. The mixing times are important, as is careful scraping down the side of the bowl for an evenly blended batter. I used this technique and created this recipe based off of the method used by a yellow butter cake found in one of my trusty cookbooks. I am quite proud of the result. This batter was so thick before adding the remainder of the liquid and the egg mixture that I am pretty sure I almost burned out my mixer motor! Granted, I only have a hand mixer, and a stand mixer could definitely handle the thickness much better, but still – my trusty hand mixer has been with me through many a baking adventure. 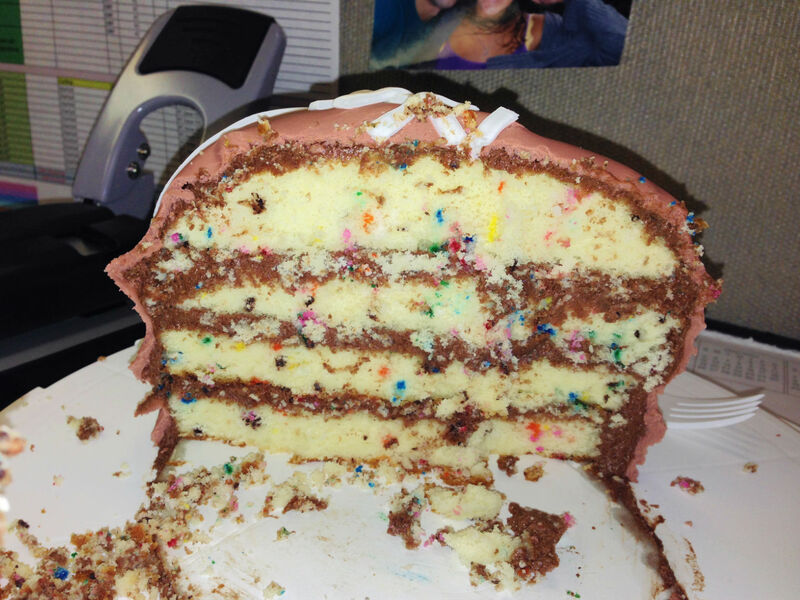 To shape this cake, I made two 8” round layers and torted them once to give me four approximately 1” layers. 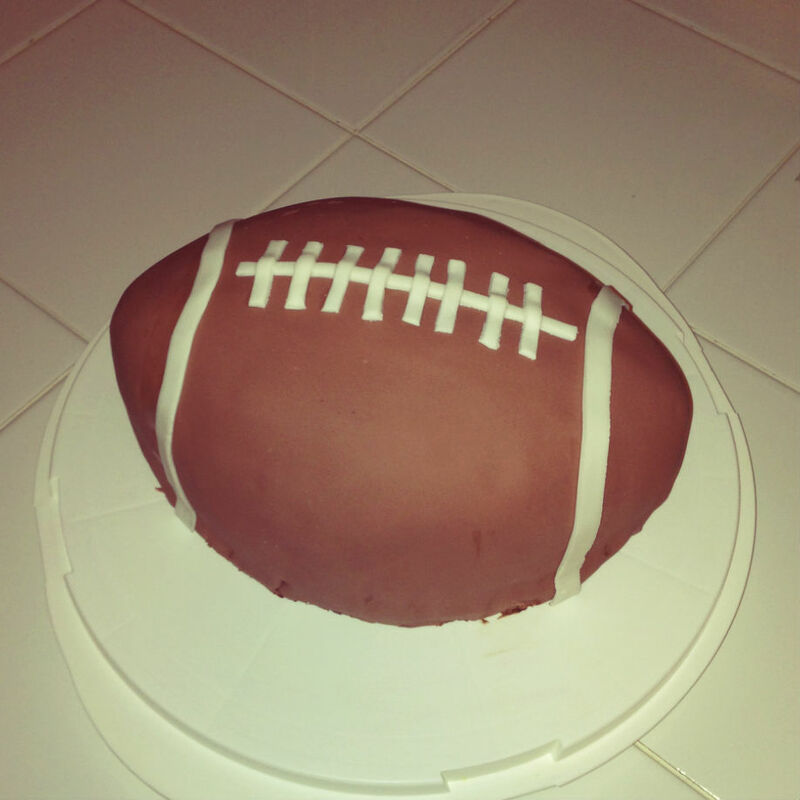 I then took an 8” round cake board and cut it roughly to the shape of a football (sorry, I only have an “after” picture!). I stacked the layers on the board, filling each layer with a generous helping of chocolate buttercream (can’t get enough of that stuff!). 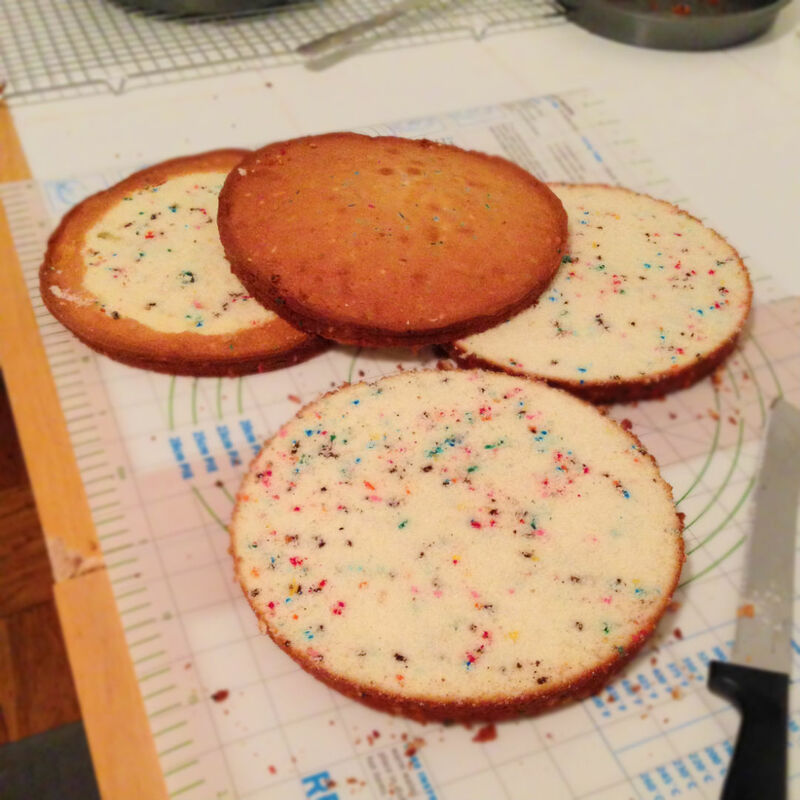 I then began shaping my cake, slicing off the sides of my round cake and shaving down the top. 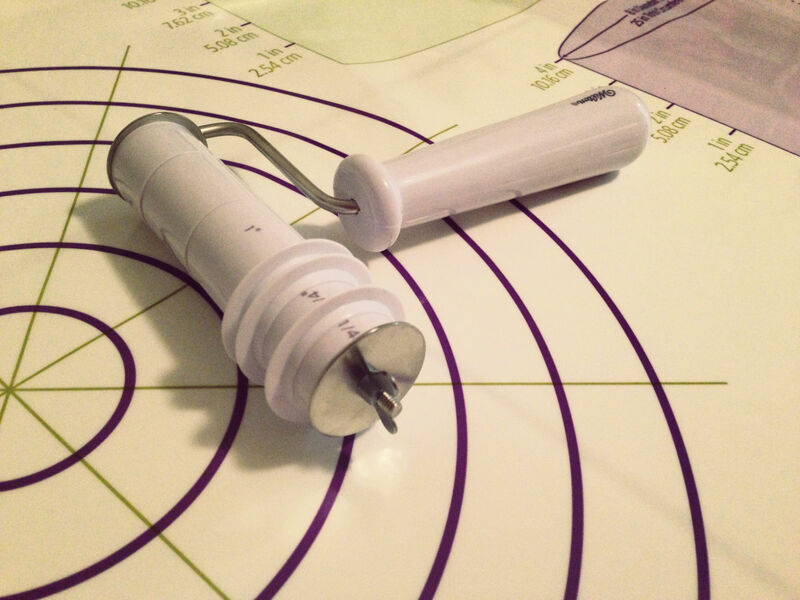 Tip: Always cut less first because once you chop it off, it is very difficult to “glue” pieces back on! 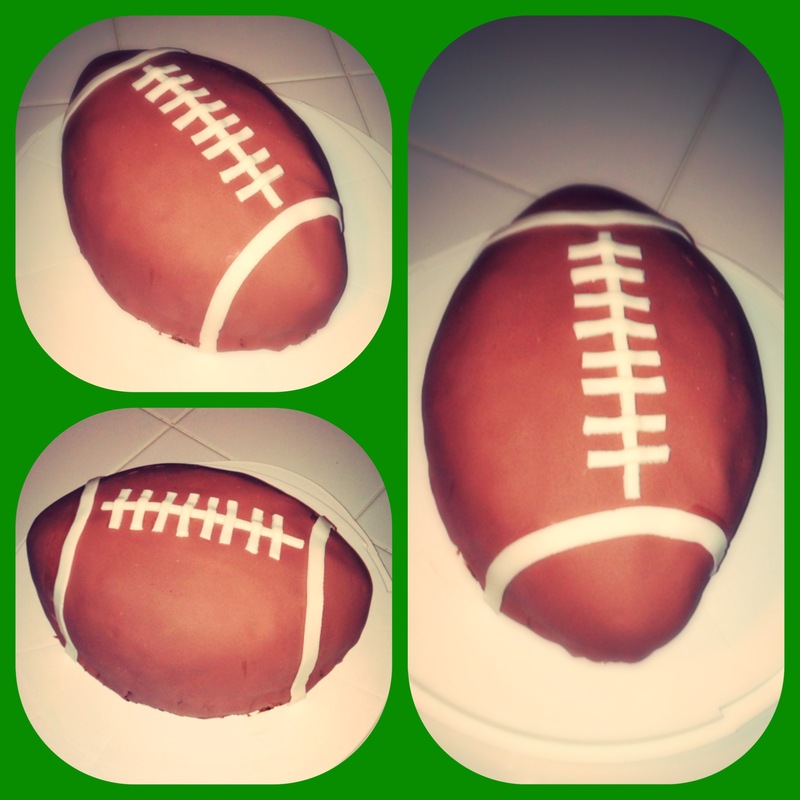 Once the cake was my desired football shape, I slathered on more buttercream! You don’t have to be too particular or smooth with the buttercream, and can fill in any needed crevices with it, because the fondant cover is very forgiving, thank goodness! For the fondant decorations, I attempted employing my skills acquired in my Wilton course 3 cake decorating class. I succeeded mostly, but my fondant work is still not perfect. To prepare the fondant, I started out with a hunk of fondant about the size of my fist. Again though, it’s always preferable to overshoot and have a little extra than to run out and have a fondant-less corner on your cake! (I use Satin Ice fondant – far tastier than Wilton! Duff brand is good too though and can be found in your local craft store. I’ve only found Satin Ice in specialty stores or online.) After adding several drops of brown Americolor Soft Gel Paste food coloring (this kind is my favorite), I kneaded the color into my fondant. I did this I think three times before reaching the desired darkness. Guess and check, my friends. For an 8” round cake, you want at least a 10” round piece of fondant. (You can find all these recommended measurements online. Just Google it and you will be overwhelmed by the wealth of information on covering cakes with fondant! Since my original cake was 8”, I figured this was a good starting point. When I rolled out the fondant, I made sure to give it a little extra size since this cake was a little on the tall side. I used 1/16” thick rolling bands on the ends of my roller for an even fondant thickness. The first time I rolled the fondant out, it was too sticky and stuck to itself when I rolled it onto my fondant roller to transfer it to the cake. The second time, I put a little more cornstarch/powdered sugar mixture to keep it from sticking, and didn’t wrap it so tightly around the roller. It worked! To make the white stripes, I used this nifty little fondant cutter. It comes with all these different “blades” that come in different shapes (zigzag, squiggly, etc.) and it has different spacers so you can make ribbons whatever width you like. It is great. Tip: Work quickly when working with fondant so it doesn’t dry out and start cracking. Put unused fondant in a sealed bag or rolled flat between a plastic mat to prevent it from drying while you work on another piece. Once I cut the white strips, I put them in between plastic to keep them from drying out at all while I was laying everything out on my cake. I used gum paste glue (a mixture of gum paste dissolved in water) to stick the white stripes to the brown base. I am happy with the result. It looks quite lovely from this angle. As you can see, I think my problem here was I did not pull quickly enough for the fondant to fall flat, so it bunched like a table cloth here. It may have also been a little on the thin side…Or I am not sure. Hopefully my next try will give me some insight into why this happened. Now, if I had been making this cake for the purpose of presenting it at an actual party, I would have put a little grass border around the bottom of it to hide the seams of the fondant. Since it was just for practice and I was taking it to work, I really didn’t feel like making another small batch of green icing for the sole purpose of grass. I got what I wanted out of this cake, which was fondant practice. 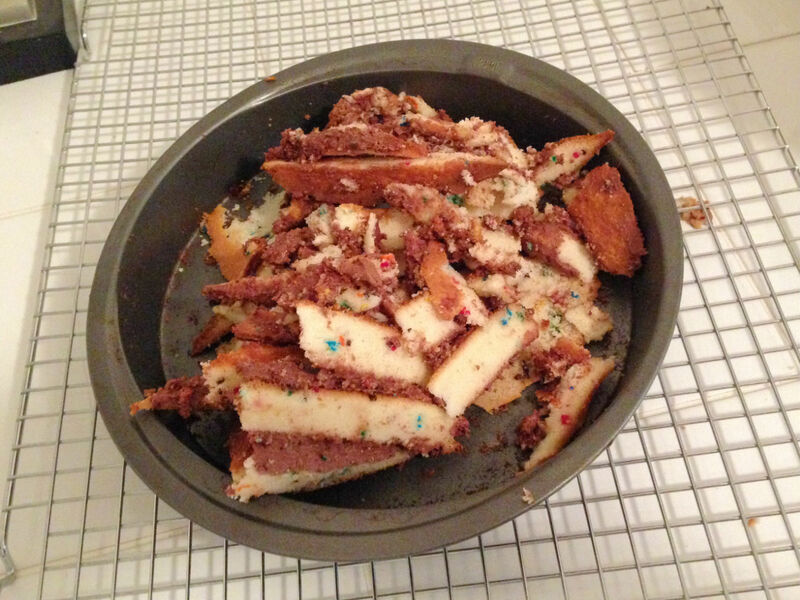 And my boyfriend and coworkers got what they wanted out of it, which was delicious cake. Everyone was happy and wanted seconds…win-win! I hope you try this truly scrumptious recipe! Enjoy! Preheat oven to 350F. 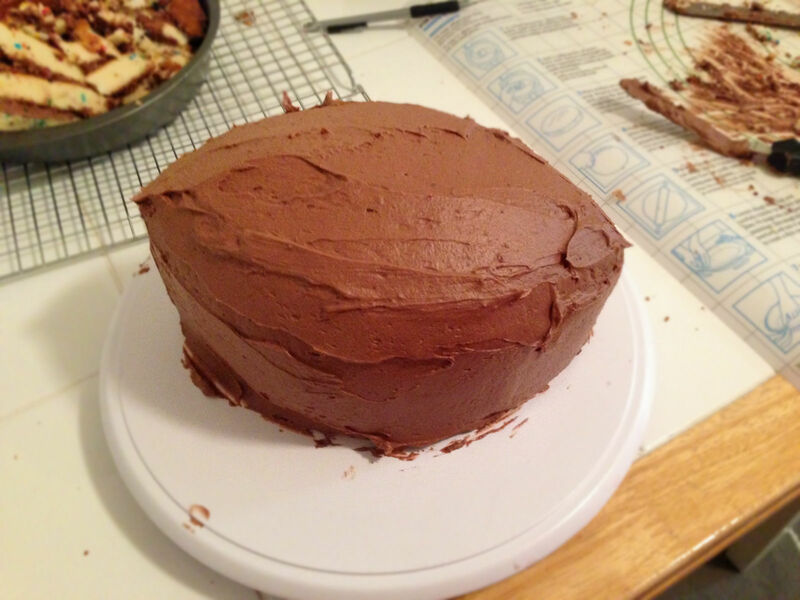 Coat two 8″ round cake pans lightly with cooking spray. Sift flour, sugar, baking powder, and salt in a large bowl. Add the butter and half a cup of milk to the dry ingredients, mixing on medium speed until smooth (about 4 minutes). Scrap down sides of bowl as needed to ensure even mixing. Divide batter evenly into 2 pans and bake until layers spring back when touched lightly in the center, or toothpick inserted in the center comes out clean. Allow layers to cool completely in the pan on wire rack. *Make sure to be precise with mixing times, as this ensures the batter is well-blended and the resulting cake is the desired consistency! Cream butter for a few minutes in a mixer with the paddle attachment on medium speed. Sift powdered sugar and cocoa into the mixing bowl. With your mixer on the lowest speed (so the dry ingredients do not blow everywhere), mix until the sugar and cocoa are absorbed by the butter. Increase mixer speed to medium and add vanilla extract, salt, and milk/cream and beat for 3 minutes. If your frosting needs a more stiff consistency, add a little more sugar. If your frosting needs to be thinned out, add additional milk a little at a time. *Note: I use vanilla extract and milk in mine. Sooo, let’s start with the good news first. I made an adorable little 6″ round cake last weekend. My standard vanilla yellow cake recipe with classic buttercream frosting. It was very cute, and tasted delicious, see?